posted August 15, 2014 09:10 PM bonus applied by OmegaDestroyer on 15 Aug 2014. Edited by Storm-Giant at 12:08, 11 Oct 2014. Due to the overwhelming amount of posts lately it is easy to overlook important information concerning Heroes 7. This often leads members to repeating similar questions or fall prey to misinformation. We will list a number of popular questions but keep in mind that this thread is for reference and not discussion. You may ask for clarifications if you did not understand properly but offtopic posts will be cleaned. - What is the current vote on? - What does Luck and Morale do in H7? Xavier Penin: Good Luck gives increased damage and good Morale gives an additional "half turn". In contrast to Heroes 6, negative Luck is back and "fumble" is synonymous with try again or reduced damage dealt. - Will the Map Editor have the Event function again? The "blue-ball" in the H3 Editor was one of the most important features for a creator to have. Placing that single object empowered the maker to call for an ambush, a morale change, joining troops, goodies, etc. Gary Paulini: The "blue-ball" is not coming back... but is evolving! Indeed, the Unreal Engine 3 offers great tools to all map makers and modders. In addition to all existing scripts on our database, fans will be able to create and share additional ones to enhance the experience. - Will primary attributes return (attack, defense, spell power and knowledge) or will it be like in H6? 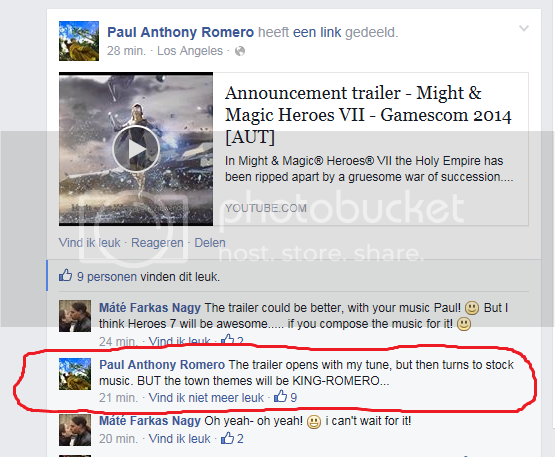 Xavier Penin: Primary attributes are making their grand come back in Heroes VII. Based on all we learnt from traditional Heroes titles we decided to re-implement them, the only difference will be the nomination of some of them. - How will the town building trees look like? What Heroes games are they most similar to and is there anything new about them? Xavier Penin: The Town Building system is very similar to the one from H5, but offering you more choices and more buildings affecting many aspects of the game. You can read more about Town Building here. - How many factions will be in the original release? Six, with haven, academy, stronghold, necropolis and sylvan having been confirmed. The last remaining one will be voted by the community. - What is ubisoft's official communication channel? This time instead of facebook they are using a dedicated website, the Shadow Council. You can learn more about it here but in short, it will be a place to follow the progress of Might & Magic Heroes VII game development, obtain insights about the upcoming features and more. - Is there a trailer? - Where can I find the gamescom demo video? - What about the music? Paul Romero and Rob King are back! So far they have officialy revealed two Faction themes: Haven and Sylvan. - Who is the developer? Limbic, the guys who took over H6 patching and balancing when BlackHole went bankrupt and also created Might&Magic X: Legacy. According to the CH Q&A: Legacy gave them the opportunity to do a full production cycle with Ubi � including all the required processes from localization, quality assurance, marketing, community work, etc. Before they took over H7 they had a fruitful post-mortem with the Ubi team about what went right and wrong. You should have seen that post-morten document! Maybe sometime..
- What is known of the town screens? They will be 2D animated. Here is the one for academy. - How many units will each town have? Will they be divided in tiers? There will be three tiers, core, elite and champion. Each town will have three units in the first two tiers and a choice between two champions in the last one. - Are unit names final? - Will town/dwelling conversion return? - What about global recruitment or caravans? Recruitment will no longer be global, there will be caravans for transporting units from other towns/dwellings. Xavier Penin: The new thing is they�re a mix of creatures and war machines, destructible, buyable, upgradable... They are unique to each faction and offer various gameplay styles. Each faction will have some kind of ballista, first aid tent and catapult though they will be different than before. For instance haven will have a priestess as a warfare unit, instead of a healing tent. - How does the skill system work? It will be a kind of mix between H6 (full control is in your hands) and H5 (skills are structured in a wheel). Heroes have a class (like Paladin) that defines their skills and also a faction skill. Skills have a global effect and offer access to abilities, which have a more specialized effect. When levelling up, the player must spend a point to upgrade a skill or buy an ability. Skills are divided into Might, Magic and Neutral categories and are consistent with the Hero's class. - How will the racial skill work this time? Will it have unique abilities scattered throughout the skills like in H5? Will it have its own skill tree? Each racial skill will offer a specific skill including different special related abilities. An example with the racial skill of Haven (work in progress of course! ): Righteousness - "Whenever a friendly creature has good morale, all other friendly creatures get +X morale until they have good morale. This effect can stack up to the morale cap". - What will the magic system be like? The magic system in Heroes VII will be very close to the ones implemented in Heroes III & V. Spells are outside the skill system again, and must be learned in town guilds, adventure map buildings or from other Heroes. - What about the ingame resources? There will be 7 resources in Heroes VII, some of them linked to specific units tiers. Some factions will need certain resources more than others but they will have the means to gather their preferred resources even in difficult situations, through hero abilities and town buildings. The seven resources of H7 are: Gold, Wood, Ore, Dragonblood Crystal, Starsilver, Shadowsteel and Dragonsteel. - Is H7 using the engine of H6? They look somewhat similar. No, H7 is using the unreal 3 engine. - Will there be a map editor from the beginning? Yes, there will be a map editor released with the game. It is considered a core feature and should be as accessible to players as possible. - What about an RMG? Gary Paulini: As I said previously, we're really working a lot on the map editor! We'll provide you more information as soon as possible. - Is there an online system? What about DRM? Uplay is a part of Ubisoft corporate strategy so it will be part of Heroes VII. However, Uplay doesn't mean permanent connection anymore. Just like Steam, you have to connect once to activate your game and then you can play offline as long as you want. - What can you tell us about battle system and battlefield? Xavier Penin: The motto for the battle system in H7 is less abilities, more tactics. We want dynamic battles with movement, risk and sacrifices. We want to encourage offense and reward smart placement of units and use of space. Also, we want to strongly emphasize each faction's battle style, through faction skills but also creature stats and abilities. Another big topic is the variety of battle maps and NPC formations. You will encounter surprising terrain and enemy formations, varied armies using specific tactics. Combat Maps will use different sizes and layouts, forcing you to revise your strategy and think about what�s best during any specific combat. - What will the campaign be about? Where are we in the MM timeline? The story of Might & Magic Heroes VII takes place in 853 YSD. That's ten years after the Fourth Eclipse and the death of Empress Maeve Falcon, leaving the throne empty and the Empire in turmoil. After countless battles, treaties, betrayals and alliances, two contestants remain to claim the crown: Ivan of Griffin, and Seamus of Stag. We meet Ivan in a state of self-doubt: the war has taken its toll on both his body and mind. Now he is tired of it all, wanting to lay down arms, declare the independence of his Duchy and leave the Empire to Seamus. But as he's about to make this fateful decision, his council of advisors (among them a few familiar faces) start telling him stories of past heroes, who, like Ivan, were faced with impossible choices. - Will the area of control feature return? Yes though there have been some changes since its last iteration. - Will the game require an online connection to play? No, you will you have to register your game in Uplay once and after that you can play offline. - Will there be changes to the adventure map? Some locations will be possible to destroy or repair. Permanent changes to the adventure map will be possible like a scripted avalanche that can block a path. - Is the interface final? No, the showcased version will have to go through a number of changes and some of its elements are placeholders. There will be hotseat and LAN. Skirmish and Duel modes will return. More to come soon(TM). - What is known of the campaign? There will be 7 campaigns of 4-6 maps each: one per faction and a final one. You can do the "final" campaign anytime but the less campaigns you've completed, the harder to complete it will be. Is a new mechanic, introduced first in Heroes Online. Creatures will do additional damage when attacking from the sides/behind. Some minor updates on things that were already known. If you have any questions let us know! A little bit philosophical question. Why there are two champion, and in this case why no choice for every creature then, like in Heroes 4? Is there any official answer for this? Simpler, easier and less costly? Maybe we'll get more options in the future. I just found out about this, hell yeah! What's the approximate release date? We only got 2015. If I recall correctly it'll depend on how the development process of the game goes (if they need more time it'd come later on the year). Yes, there will be more interaction with the adventure map this time. Everyone on the web says devs said they will get rid of mono-coloured factions but I haven't seen such a statement in any of the Q&As. Is there any truth behind these claims? That is the plan but the game is too early into development to have any tangible proof. Marzhin, can you tell us if you plan making Dungeon purple like H6 or not? It'll make voting easier. They won't be as monochromatic. At least that's the plan. Don't know how I skipped that. Thanks. Hotseat and LAN multiplayer are mentioned. What about PBEM (Play By E-Mail?) Players of the HOMM series have a long history of hacking through hotseat saved games to play with each other through e-mail. It's long past due that PBEM be implemented properly. Edited by ryu at 21:20, 03 Nov 2014. IMHO, PBEM option would make a lot of Heroes fans very happy. HoMM games usually require very long time, therefore it is hard to arrange multiplayer sessions between players. PBEM games would make it possible to make their move (play their turn) whenever it is possible for every player. We can always be in game! In this tablet and smartphone era, isn't it the new trend because of the mobile games? I hope PBEM option can be included in Heroes 7. Edited by VieuxSinge at 17:48, 13 Jan 2015. Hello friends of the M&M franchise! One question was not mentionned in this Q&A : will we see the return of simultaneous turns in multiplayer (not present in HOMM6), and will it be expanded (meaning once simultaneous turn is deactivated because players met, it can be activated again once their heroes cannot interact with each other this turn)? Or even more interesting, is it possible to have a permanent simulatenous turn (allowing a game of catch between heroes) all game long even when players can interact with each other? there is a mod that does this for HOMM5 (link: http://steamcommunity.com/app/15370/discussions/0/540743758000530320/) and its really awesome. Question that NO ONE has answered. My question is what are the system requirements to play the game? I'd like to buy this for my wife, but I need to know if her computer will run it. Ubi has no information on their website (what a suprise huh?). Anyone have a line on the min/recommended sysreqs? I have a question about the adventure map - will we be able to zoom out as much as we want? I really like to play the game zoomed out, because I want to feel like I'm playing a strategy game, not a RPG. So please, give us the option to zoom out a lot. You can zoom in and out, no worries. Anyone knows why the game name is "H7: Falcon's last flight"? Sure hope its not the last gameof the series or something.